Victoria City Hall is among other cities in North American taking part in the "Teal Pumpkin Project." 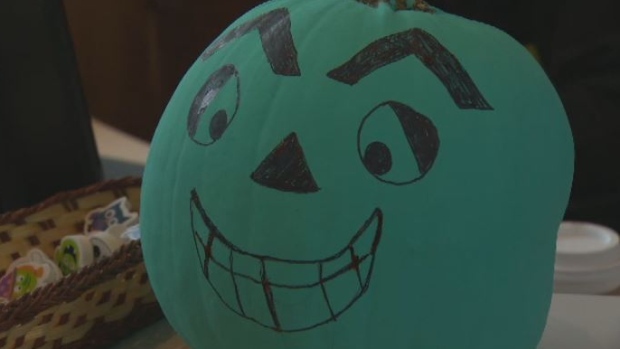 The blue-green pumpkin placed at city hall's front desk alerts children that it's a place offering non-food treat options. "We wanted to get onboard with them and harness that energy to bring it to Victoria and make people more aware that people do have food allergies," said Victoria Fire Asst. Chief Brad Sifert. "This is the time of the year that we have to remember everyone and be inclusive." Trick-or-treaters are welcome to pop into city hall before doors close Wednesday night to pick up traditional treats – or things like spooky pencils and erasers. According to Food Allergy Canada, more than 2.6-million Canadians report living with at least one food allergy – and two in 100 children suffer from peanut allergies.